I began studying art at the age of twelve, under my father’s instruction. I acquired a master's degree in Sculpture from Humboldt State University in 1981. I began working on access to the arts for visually impaired people in 1983. 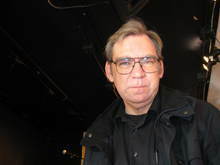 I started the audio description service in Seattle in 1985, and founded the non-profit corporation, Arts and Visually Impaired Audiences, in 1991. I have written and produced several radio plays, including “Margaret Jean, A Radio Portrait,” which has reached national audiences on the NPR Playhouse, and “Turf Fire,” Irish stories of Halloween adapted from storyteller Joe Heaney, broadcast on stations in Washington State. I have written and produced my own plays, including “He Needed Sleep” in 1987 and “Dust Jackets,” with a King County Arts Commission Playwright’s Production grant in 1991. In 1999, I collaborated with sound artist Susie Kozawa on “Nearly Seen, Closely Heard,” an interactive environment of computer graphics and sound for Jack Straw Productions. My story, “A Sweater in a Chair,” appeared in The Raven Chronicles’ Urban Writing issue, 1999, Volume 8, Number 2. "Texas 1952" was part of the Seattle Playwrights Alliance's first "New Waves" radio production, "Taboo", in 2000. My literary work has appeared in anthologies and performances on radio and spoken-word CDs, including the prose poem "Love Dog" with original drawings by me in The Wandering Hermit Review #2. "Love Dog" was adapted for dance in Phrasings for Word and Dance, Bellingham Repertory Dance Company, Bellingham, Washington, 2007. The story "Jigsaw Magic" appeared in when it rains from the ground up #4, 2007. The poem "Sylvia's Hair" appeared in Raven Chronicles, Summer, 2008. I produced and published the spoken-word CD and chapbook, Since the Ace: the Poetry of Charlie Burks, as well as a radio program of that material broadcast on KUOW-FM. I teache a class in radio theater each summer to blind and visually impaired teenagers. In June 2008 Wood Works published a collection of my stories and poems entitled Shortness of Breath & Other Symptoms. Samples of my ongoing work can be read online at http://blog.myspace.com/jesse_minkert. My father was an artist in a place that did not value art very highly. He was my first teacher, and my first example of how art can define a person, single a person out among all around him, be used as a tool of individuality. But my personal compulsion to create has less to do with me than with the work itself. I write, rather than paint or make sculpture or play music, for practical reasons mostly. Writing is compact and easy to carry. It stores neatly and does not require large pieces of equipment. I write to perform before an audience. But I came around in time to the idea that writing is one of those deep mysteries, so deep that a lifetime may not be all that I need to understand it. Mostly, I like to do nothing in the world more than make things up from nothing, or just from the bits of things lying around in my head. Rick Moody, Lawrence Sterne, Jonathan Franzen, Donald Westlake, Anton Checkov, Charlie Burks, Jared Diamond, Donald Barthelme. Thanks, Darryl. I'm beginning to feel welcome. "Writing is one of those deep mysteries" just about says it all to me. Welcome. Hi Jesse, thank you so much for your comments to my "Vague Recollection" story. You must log in to write on Jesse Minkert's wall.